After a year of submitting these near-weekly dispatches on all that’s good about Boston bars, I consider myself to be fairly well informed on the matter. And while I’m no food critic or cocktail whiz, I feel reasonably qualified to share my experiences with friends, family, and complete strangers. But when it comes to an issue as contentious as barbecue food, I stay safely above the fray. Few types of cuisine send ordinary folk into such paroxysms of fierce, uncompromising opinion as barbecue. If you’re in mixed company and express a fondness for Somerville’s Redbones, you’ll be dismissed as a rube and given an unasked-for lecture on how overrated their food is. God help you if you don’t pay the proper respect to Blue Ribbon in Newton and Arlington – near consensus exists on its awesomeness. But even a reverent discussion of Blue Ribbon can be hijacked by the breathless report of someone who recently returned from a trip to South Carolina, where they stumbled upon the best BBQ place ever. Yet the credibility of a traveler can be shredded by a native of the Deep South who can tell you how barbecue really is in, say, Alabama. There’s no end to it – heated arguments about baby back ribs v. St. Louis ribs; saber rattling about wood chips; disputes over sauces nearly coming to blows. Myself, I’m not that picky. So if you’re expecting a declaration of where Sweet Cheeks ranks among the local BBQ eateries, you’ve come to the wrong place. But if you’re like me and think that a plate of smoked meat, some spicy barbecue sauce, and a few cold beers are the ingredients for glorious night of down-home decadence, then by all means, keep reading. Whatever your preference or how strong your opinion, there’s no disputing barbecue’s popularity. 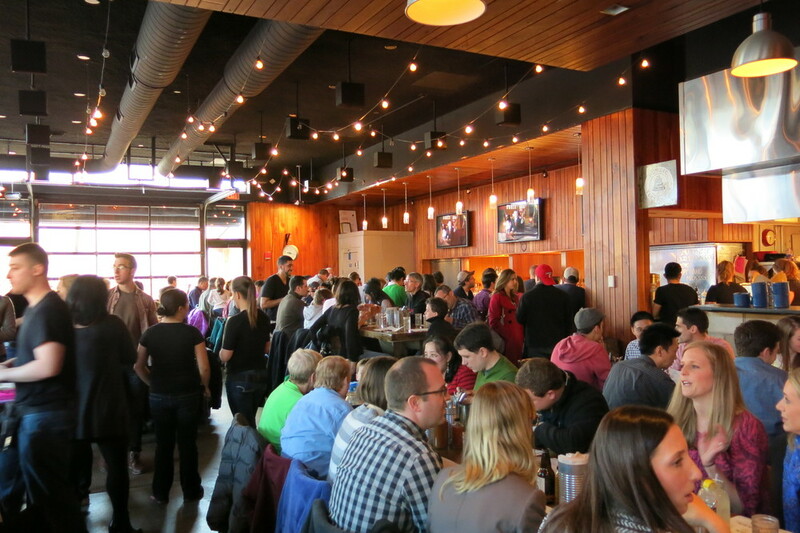 Case in point – I called Sweet Cheeks on a Friday afternoon to reserve a table for myself and a few fellow barhoppers on Saturday night; I was told they weren’t taking any more phone reservations, but walk-ins were welcome. I should have known right then I’d have my work cut out for me. But I am, after all, Boston BarHopper – and thus, not averse to hanging out at the Sweet Cheeks bar for an hour or so, sampling the liquid offerings while waiting for a table. Just to be safe, I went in early to get a few pictures before the place filled up. And this is how it looked at 5:30. Forget sitting at the bar; I could barely get to the bar. Eventually my cousin Adam and I squeezed in, ordered some drinks, and retreated to the waiting area with Kelly, Melissa, and Adam’s girlfriend Danielle (there was also a brief, mysterious cameo by my other cousin, John, but I have no visual proof that he was present). Sweet Cheeks is the brainchild of, and first restaurant from, chef Tiffani Faison. As a former finalist on the reality show Top Chef, it’s probably safe to say that Faison knows her way around a kitchen. She also knows plenty about Boston, having lived here and worked in various restaurants in the city before making her name. But it was a BBQ-soaked road trip through the Texas that provided the inspiration for Sweet Cheeks. And a drive through the Lone Star State contributed more than just ideas on the best way to prepare good barbecue food. Indeed, while Sweet Cheeks may be north of the Mason-Dixon line, it spares no detail in channeling the essence of a southern roadhouse. Long wooden tables, a concrete floor, wood-paneled walls, and lights strung along the ceiling attempt to capture the milieu of a humble, open-pit BBQ shack along a rural stretch of road in Texas. 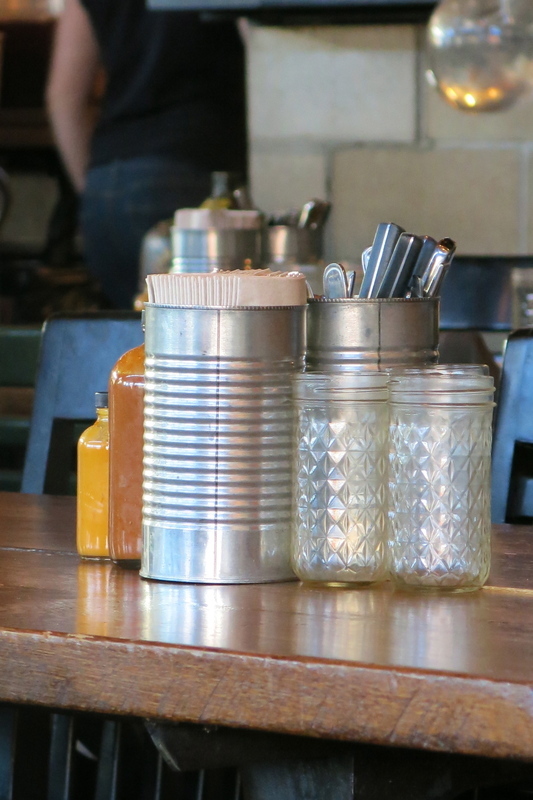 Food served on metal trays, silverware and napkins stored in reused coffee cans, and drinks served in mason jars further evoke images of earnest, hard-working folk and southern hospitality. It was probably more luck than hospitality, but despite the crowd, our wait was actually less than an hour. That’s not terribly long on a Saturday night, but the minutes seemed to drag on endlessly as waiters rushed by us with platters full of treats. The aroma of wood-burning smoke wafting toward us the whole time was torture. When we were mercifully shown to our table, I don’t think we were even in our seats before we called for some appetizers. First up was the most quintessential of BBQ snacks – hush puppies. If deep-fried cornbread isn’t the most fitting prelude to a bacchanal of barbecue, then I don’t know what is. Along with that was the bucket of biscuits, which actually came in a can as opposed to a bucket, but nobody said anything. Soft and warm, they would have been pretty satisfying on their own, but a whipped honey butter gave them an added dimension of deliciousness. With some appetizers to take the edge off our ravenous hunger, it was time for another round of drinks (I’m sorry to report that it was too chaotic in the waiting area to take pictures of our first round; but the Dollywood cocktail was a huge hit). Kelly ordered the House Bill 819, a mix of tea-infused Berkshire Mountain corn whiskey, lemon, mint, and simple syrup. It was an intriguing combination of flavors, but really intense up front; I think the tea was a little too much. I heard no complaints from Kelly, though. Adam wisely got the Left Hand Milk Stout, on nitro, which was just tremendous; smooth and creamy, with hints of coffee, chocolate, and vanilla. 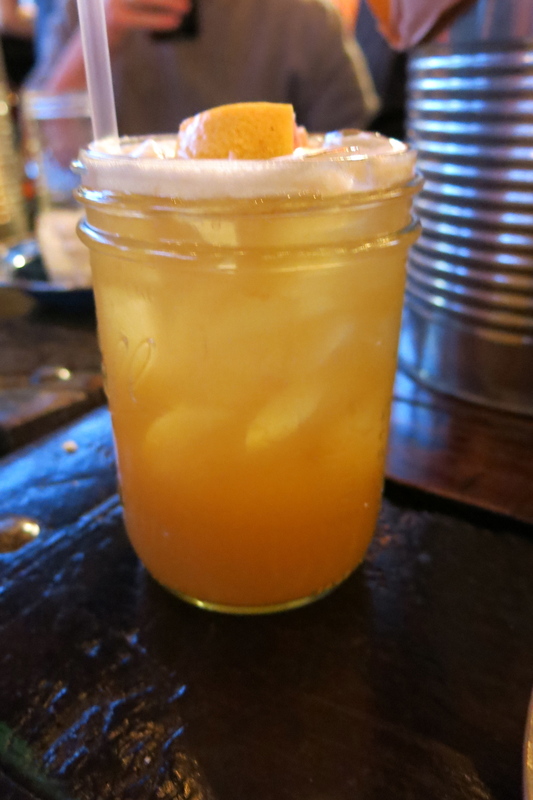 Danielle opted for Kentucky Rosie – rye whiskey, pineapple, grapefruit, and lemon juice, and simple syrup. The sweet and tart flavors worked well with the spicy and bitter essence of the whiskey. I went with the Indian Summer, made with apple cider and no fewer than three types of rum – coconut, spiced, and Cruzan Black Strap. If that isn’t enough, the rim was lined with toasted coconut. It was tasty and sweet, but even as a lover of all things coconut, I found it to be a little excessive. Satisfying as the appetizers were, the main event was still to come. 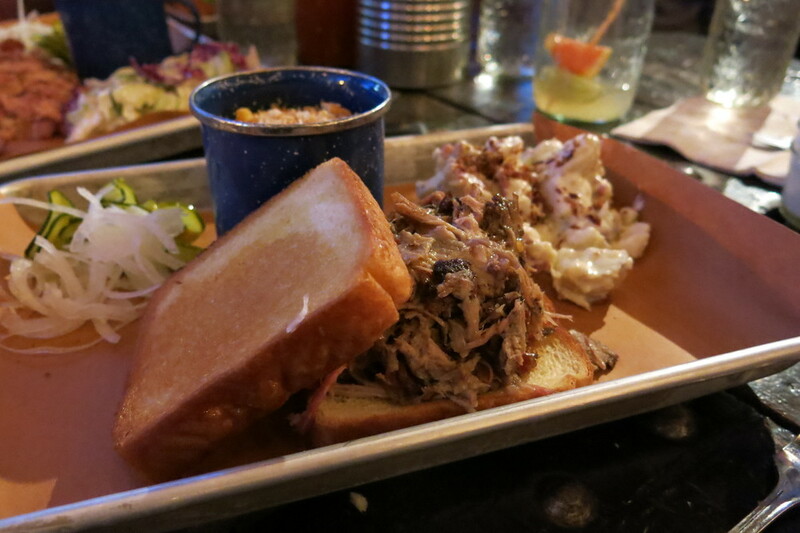 Sweet Cheeks’ menu has all the staples of a good ol’ southern BBQ spread – ribs, brisket, pulled pork, chicken, black-eyed peas, mac and cheese, fried green tomatoes, you name it. You can get a “tray,” which comes with one type of meat paired with two sides (one hot “scoop,” one cold), or a sandwich, which lacks the sides (unless you pay extra). If you prefer your meat with a side of more meat, you can opt for the “Big Cheeks Tray” (two meats) or “Fat Cheeks Tray” (three). Whether you can order either of those without feeling a little self-conscious is your own business. At last, our patience was rewarded with a feast of smoky magnificence. For Danielle, it was the fried chicken tray with salad and a scoop of mac and cheese. Kelly got the pulled pork tray with mac and cheese and potato salad. Adam opted for pulled chicken sandwich, served (naturally) on Texas Toast. He added potato salad and mac and cheese so he could have a tray like the rest of us. Mel ordered the pulled chicken tray with collard greens and cole slaw. And I got the pork belly tray with potato salad and collard greens. We dug in with such gusto that the waitress felt compelled to remind us that utensils were available and that their use was encouraged. Danielle practically made a scene over her fried chicken, which she demanded everyone try (and yes, it was worth the fuss). In a comparatively quiet voice, I offered samples of my pork belly, privately hoping no one would hear…but they did. 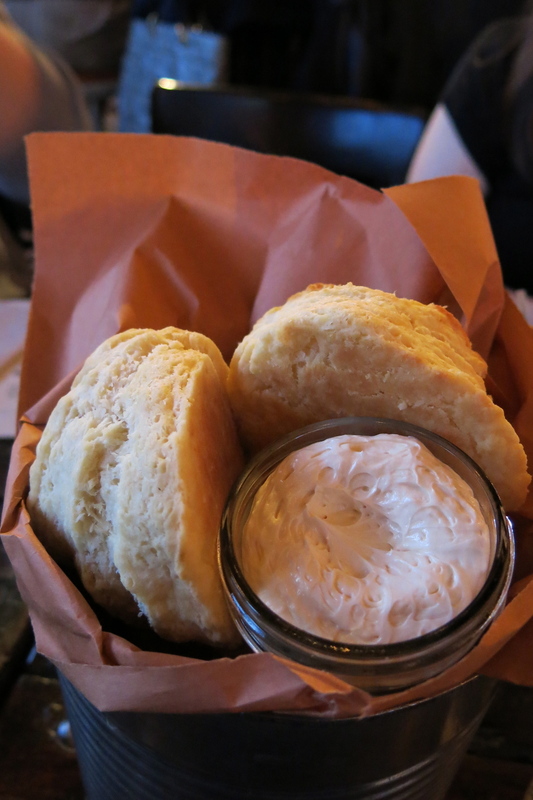 Unsurprisingly, it was a hit – spicy and tender enough to melt in your mouth. Even the sides were impressive. Some of them, like the collard greens and mac and cheese, were served in a coffee cup; whether this is part of some southern tradition or just an exercise in novelty, I don’t know. The potato salad was popular – and topped with bacon crumbs, why wouldn’t it be? Even the cole slaw, which normally wouldn’t warrant a mention, stood out with its creamy texture and vinegary flavor. If you somehow have room after such a meal, there are a few dessert options, like butterscotch pudding and warm apple pie. None of us could fathom that, but we did manage a couple more drinks. Mel got the Damn Yankee, sort of a twist on a Manhattan (a drink she doesn’t particularly care for, so I’m not sure what prompted that order). 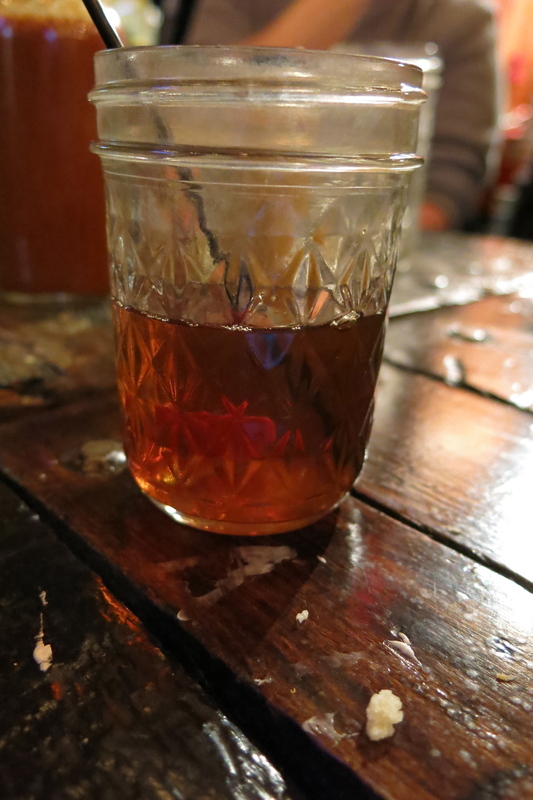 Made with Johnny Drum bourbon, Sapling maple liqueur, and maple bitters, it was kind of like a backwoods Manhattan with its rich, rustic maple flavors. I meanwhile looked to the beer list. Sweet Cheeks has a pretty respectable beer selection; on draft, there’s small offering of rotating microbrews, like the Left Hand Milk Stout that Adam got. Along with that is a ton of bottle and can options, with some top-notch craft beers and plenty of old favorites. I closed out with a classic. With so many quality beers available, you might consider a cheap can of PBR might to be a wasted order. I disagree. Because while I might not be an authority on what constitutes the most authentic barbecue food, I do know what goes best with it. If you want a statement on how Sweet Cheeks stacks up to other BBQ places in the area, you’ll have to consult an “expert.” You’ll likely have no trouble finding one. All I can say is that my pork belly was phenomenal and I’d order it again in an artery-clogged heartbeat. It’s a relatively small bar, and it’s tight quarters with the tables close by. I can’t imagine coming here just for a drink, given how crowded it gets. And why on earth would you come here and not eat? If you can sit there amid the heavenly smells and just have a drink, you have way more willpower than I do. None of the specialty cocktails wowed me; but then again, what goes better with barbecue than beer? Sweet Cheeks also has an excellent selection of whiskey, and bourbon in particular, which seems appropriate for a southern-themed restaurant. Prices are in line with Fenway-area restaurants, but they’re quite a bit higher than other local BBQ places. Our trays ranged from $18 to $21. The hush puppies were $7, and the biscuits $10. Still, there’s something for every appetite and budget – from a single rib for $3 to the Big Rig for $450, which seems to be 20-plus pounds of food for up to 10 people. Cocktails are $10, which is pretty standard, and beers range from $3 (PBR) to $9 for some craftier options. And while I mentioned how crowded Sweet Cheeks was, don’t let that daunt you. A BBQ joint is always going to be busy, even more so when it’s run by a popular chef. Plus, tables seem to turn over pretty quickly. I figure that’s because like me, most people inhale this stuff and then quickly depart before slipping into a food coma.